IRS ransomware uses sophisticated techniques to infiltrate computers and hide from its victims. Use Reimage to determine whether your system is infected and prevent the loss of your files. 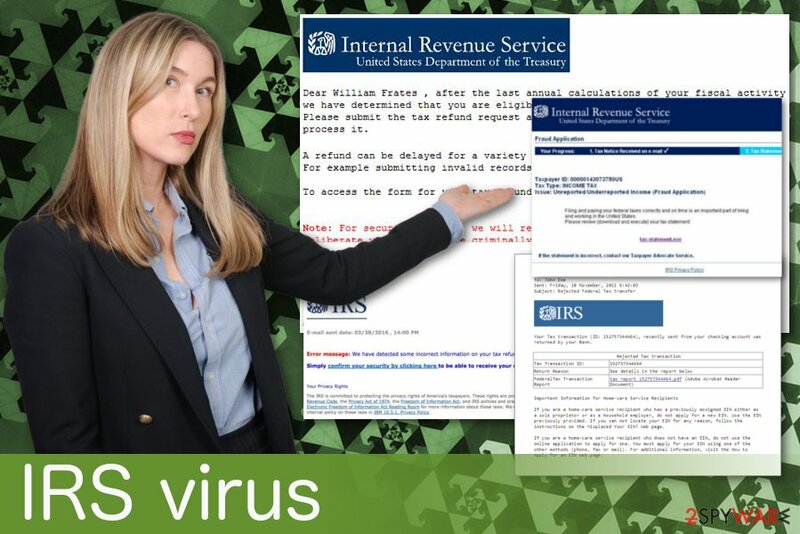 IRS virus is a scam created by cyber criminals with a purpose of getting money. IRS virus is a cyber threat which is spread through trustworthy-looking emails presented as an official notice from the government. Looking like it is from the Internal Revenue Service, it tricks people into installing a Trojan horse which additionally infects the computer with further viruses. As a result, within 5-10 minutes, victims are completely disabled and can't do anything on their machine. IRS malware starts working immediately after the victim is tricked into downloading the malicious file attachment from the safe-looking email notice. An email looks legitimate as it is filled with different logos and other details. However, this threat can lock your computer and prevent you from using your files or programs. This screenlocker seeks to make its victims pay the predetermined ransom in exchange for recovering the connection to the device. The infection is implemented thru this scenario: the victim receives an email from the Internal Revenue Service and finds an attachment. The message body typically looks convincing, so there is a high chance that people will click on the attachment to download it. However, when you download this attached file, the system starts acting differently. Your computer gets locked, and many programs cannot be launched. You can't even open various files on your device. The reason why scammers have released this virus is the money. Keep in mind that IRS never contacts its taxpayers about their account over email, so if you receive such letter, you're looking at a scam that has to be ignored. However, this is a phishing email campaign that is using social engineering to trick people into possibly purchasing software, programs or similar resources. This threat also can cause fake security alerts or other pop-up windows. 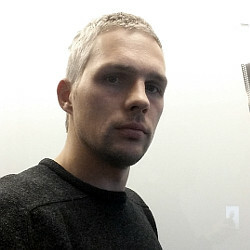 Although, the main purpose of these emails, in most cases, is to spread malware further on the system of an infected computer. You should remove IRS virus as soon as possible to prevent serious consequences hailing from such virus ability. If you keep this threat on your device for a more extended period, it may affect the performance or more significant parts of the device. IRS virus removal should be done using anti-malware tools like Reimage because the file attachment may contain more than this threat. You need to scan your system fully to find and eliminate all those programs. 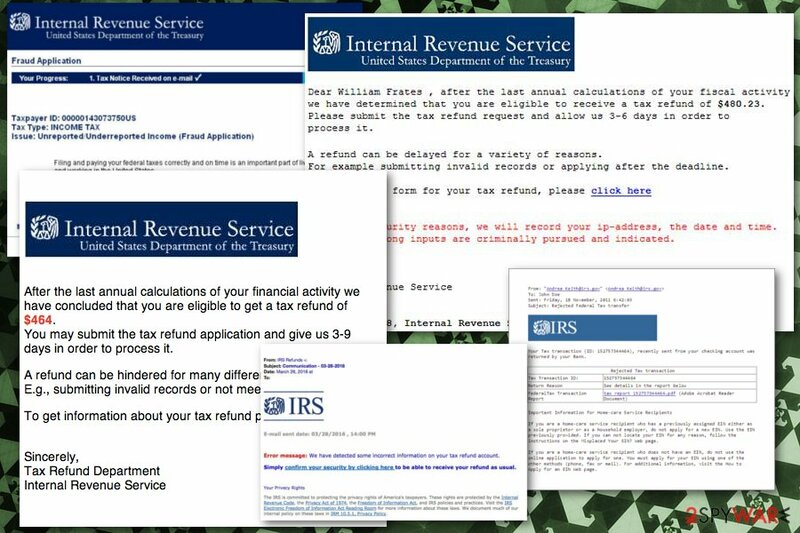 IRS virus is a phishing email campaign that displays security alerts and suggests people check their tax reports. Spam emails with various questionable attachments can be used to spread all different types of malware. Trojans can be set to install ransomware or perform a malicious activity directly. Other malware can cause background processes or spread other programs further. These emails can be infected with direct virus payload. Unfortunately, these emails look safe and legitimate, in most cases. The most significant feature of these emails can be grammar mistakes or typos, suspicious addresses. Often malicious actors use real services or even institution names on these emails. You should pay more attention while reading your emails and especially when opening attachments. You can scan the file before downloading. The best way is to delete emails form services you are not using, without opening. To remove IRS virus, you should use anti-malware tools like Reimage, Malwarebytes MalwarebytesCombo Cleaner or Plumbytes Anti-MalwareMalwarebytes Malwarebytes. Security experts claim that the way how this software works is damaging: a user is left incapable to load his files or finds all its programs and icons hidden. You need to scan your device fully to get rid of all additional programs this malware installed during the main virus installation. IRS virus removal is essential and should be done as soon as possible. This is a severe threat, so you may need to perform this removal a few times with an anti-malware of your choice. You can also look through our suggestions below if you find yourself blocked and disabled from using your computer as previously. Also, there are a few steps you can do if you want to eliminate this malware properly. Log in to your infected account and start the browser. Download Reimage or other legitimate anti-spyware program. Update it before a full system scan and remove malicious files that belong to your ransomware and complete IRS removal. When a new window shows up, click Next and select your restore point that is prior the infiltration of IRS. After doing that, click Next. Once you restore your system to a previous date, download and scan your computer with Reimage and make sure that IRS removal is performed successfully. ^ Trojan horse. Wikipedia. The free encyclopedia. ^ Margaret Rouse. Social engineering. Techtarget. Search security. This entry was posted on 2018-09-03 at 03:15 and is filed under Malware, Viruses. You can quickly scan the QR code with your mobile device and have IRS virus manual removal instructions right in your pocket. How did you remove IRS virus?